When Confessions of the Chromosomally Enhanced started in 2010, it was a way to share photos an anecdotes with our family and friends who were spread out all over the nation. Slowly, others began stumbling upon our blog and we started receiving really heartwarming feedback about how our family's story was a source of comfort for new parents who had just received a Down syndrome diagnosis. Showcasing what a smart, competent, kind, funny, and loving young woman Leanne is offered a cool glimpse into the future for those parenting children with special needs who were unsure of what adulthood would hold. The blog began to have a dual purpose: 1. a way for me to document memories 2. a way for us to advocate for individuals with special needs and hopefully create a more positive perception of what life with Down syndrome is really like. Enter Instagram. For those who don't know, Instagram is a quick and easy way to upload a photo or a short (60 seconds or less) video and add a brief caption. I joke that Instagram killed the blog star (remember that song from the 80's "Video killed the radio star"?? Anyway, I date myself and digress...) because Instagram has made me all but abandon the blog. Instagram is a lot faster and easier. For the blog, I have to upload photos off of my camera and organize them by very specific filing parameters imposed by Mr. Technology (he's very laid back about everything so when something matters to him, like having an organized home network, I try and play along). I edit the photos, upload them to the blog, and then sit down and draft thoughtful posts about specific topics relevant to Down syndrome. Then, I edit said posts, wait a day or two, read it again...and then, maybe post it. This requires a lot of uninterrupted "spare time," which is an elusive concept that evades this frazzled mother of 3 on a daily basis. With Instagram, however, I use my phone to take a photo, click on the Instagram app, add a little caption, and within 30 seconds, the memory is stored. I suspect that because I'm not the only one who struggles to find "spare time" to explore the blogosphere, Instagram has been soaring in popularity where as the blog doesn't see much action these days. That, and the technology-induced ADHD that most of us are afflicted with lends itself to glancing at a small photo and 140 character caption over wading through paragraphs and paragraphs of narrative on a blog. Am I right?! As fun and convenient as the Internet and social media are, they are not without pitfalls. As many of you know, while our family does maintain a public profile and while we happily allow strangers to access our blog/Instagram account with the hopes that our story will help educate people about Down syndrome and shape a more welcoming and inclusive future for individuals with special needs, we try to follow basic Internet safety protocol. There's no telling who is accessing this information. I suspect the vast majority of people who stumble upon our blog and Instagram accounts are tax-paying, law-abiding, upstanding members of society. But just in case, we guard our personal information closely. We do not reveal our last name nor do we reveal where we live. And even though we live in the social media "public eye," we are private about certain aspects of our lives. No, I will not tell you who I voted for in the presidential election. And things have been working out pretty well for us until recently. 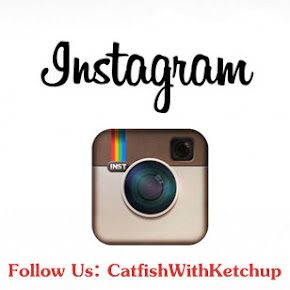 Our Instagram account, @CatfishWithKetchup, was suddenly inundated with hundreds upon hundreds of new followers. Many of the profiles contained content of a questionable nature. I am not opposed to blocking an account if it is inappropriate, but they were coming in way too fast for me to block. I literally do not have the time to check each profile. After researching Instagram "spam," I realized that many of these accounts are designed to leave comments on my feed that are lewd or that encourage our followers to click on a link that will connect them to sketchy websites. We have young children following our Instagram feed. I am not okay with our profile being used to distribute inappropriate propaganda. So @CatfishWithKetchup is private for the time being. This post is designed to address the feedback I've received and to explain to those who are disappointed why this decision had to be made. For those who have requested to follow, I will approve those requests as soon as I can, but realize I have to wade through a lot of questionable profiles in the mix. Instagram was never intended to be a platform to promote and grow our "brand" or any sort of promotional tool. It's just a place where one mom is storing her memories. I'm happy to let other people access snippets of our lives if it helps make the world a more compassionate and receptive place for my children. But we're not in the business of collecting followers; especially not if that comes with a price that harms others. My foremost responsibility is to protect my children. Your patience and understanding while we sort through these challenges is greatly appreciated. I'm sickened about this for you - creepers are so disgusting. For what it's worth, I read your blog back in the day before Merryn was around! I love that you've shared so much of your story and once I realized that you'd become too busy for blogging but were on Instagram, I joined Instagram just so I could keep up with your funny stories. I just checked and I'm still seeing your Insta posts, whew (I'm renegade_runner there). Hope you can get this sorted out easily. Oh no ...i follow you since the beggining of your blog adventure and was oune of your first followers on Instagram...i will miss Josie and Leanne very very much, and of course Merryn and Lydia too. My days will miss the sunshine your girls deliver..it was a happy place for me and my 3 kids, they love to watch Josie and Merryn videos! Im tmx6 in instagram, we are private and Im from Brazil but right now we are living in Mexico. My 4 year old daughter refers to Instagram as "Josie pictures". We follow only follow friends and family but I was captivated by your story. She has no interest in seeing her cousins pictures, but her "friends" Josie, Merryn and Biddy are a necessity. I do not know anyone personally with Down Syndrome. I don't think my daughter notices that Josie and Aunt Leanne are any different than she is. And that's the point of it all; more alike than different. Thank you for sharing your beautiful family. My girls and I appreciate it. I hope this issue is resolved quickly. So sorry for this I will so miss you all! So sorry that this happened to you -- for all it's benefits, social media certainly has its bad apples. Just wanted to say I have followed your story since Josie was a baby and really appreciate that you are spreading awareness about our chromosomally enhanced friends and family! I too have followed you for many years and I definitely understand about the privacy issues. Hope everything is cleared up soon. God bless you and your family. While I have a rather mundane life and "typical" children, I am careful about who follows me as well. I opened an Instagram account so I could follow my 14 year old daughter. A few months ago some sole my account. While I will admit that her chest was much more attractive than mine, the profile photo she added did not really reflect me or my children. It was a bit of a nightmare to fix it and Instagram is kinda all "well we can delete your account, but we can't do anything about the person who did it". Long story short, I was finally able to hack back into my own account and recover my history, but it was not fun. It's your family and your life. While I would love to continue to follow you, Instagram name apcpugh, I get it. I am still seeing your Instagram posts. I use chat books to keep the memories in an "album". It's 5 dollars a month and a perfect way to get a hard copy of the memories and the blogs you write with the picture. ". . . then sit down and draft thoughtful posts about specific topics relevant to Down syndrome. Then, I edit said posts, wait a day or two, read it again...and then, maybe post it. . . . " I am impressed that you are very thoughtful blogger. I wish more bloggers had your standards because there is a lot of poorly written blogs are there. However, could you please align all your text with the left margin? It's much easier on the eye to read paragraphs if all the text are lined up against the left margin and not centered. Please, please, please. I understand your concerns about Instagram and how you must protect your children and privacy, but I am still dying to know in what state you were living in when you lived in The Tundra. Oh well. Should be there are a lot . . .